To go along with the DIY Kate Spade Inspired Canvas I made (see post here!) 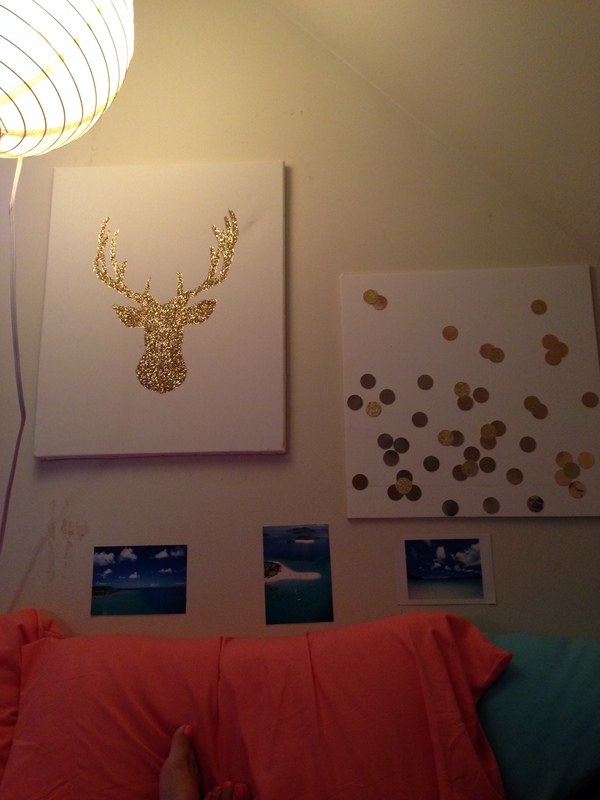 I also created a gold, glitter deer head silhouette canvas. I did this mostly because it will still look cute as a Christmas decoration in M’s house (super manly and hunting-cabin-esque), and in my room, which is wooden, white, green and gold. I was going to do a full DIY post on this project, but it was so simple, I figured an outline to follow would work just as well. Also, I was using glue that was drying quickly so I didn’t have time for too many artsy pictures. The clip art outline of a deer head that I found (thank you Google) was only 8.5×11, and looked to small on my canvas. I did a quick Google search instead of image search, and found a blog that actually made a very similar project (this is a very popular thing to make). Here is her blog post. She sounds like someone I would be friends with, so I read the whole post and found her recommendation for using Blockposters.com which allows you to upload a file and then choose how big you want to make it. It then prints it onto x number of pieces of paper and you just tape together and go. This wasn’t the best site for me because the options only go by pages (vs inches), and 2×2 pages was WAY too big for my canvas. So what I ended up doing was setting it for 1×2 pages, but 2 landscape pieces of paper on top of each other, and it was big enough. Sorry, that was complicated. Anyways, I printed out my outline, cut it out, and then traced it onto my canvas. I then painted the entire inside of the silhouette with glue. Finally, I dumped my gold glitter all over it, and then shook off the extra. That’s all there was to it! I let it dry outside for a few hours, and then brought it in and hung it up! The deer canvas looks really cool! I might have to try something similar, as I could use a few more decorations for my room! Trust me, My hands are fairly “un crafty” too, and all of my DIYs I did easily!!! Try it out!